Traditionally, brides don’t have to give speeches at their wedding – this kind of task is assumed by the men of the event (the groom, the Best Man, and the Father of the Bride, speaking on behalf of their side of the family). However, times have changed – and more and more brides these days do give speeches at weddings. Meghan Markle did it (and she did it in a very conservative context!) – so why wouldn’t you do it too? What are the secrets to delivering an excellent bridal toast, though? We have some tips for you – so read on and find out more. Keep it sweet, and keep it short. Nobody wants to hear long speeches – no matter how amazing they are, they are bound to become at least slightly boring for at least a few of the guests. Generally, a wedding speech shouldn’t be longer than 5-10 minutes so remember that time limit (and pass it on to the other people who will give speeches as well). Talk about your loved one. Show the world how much you care about him and just how happy you are to have reached this special day with them. Tell a funny anecdote of your love story and make people smile. Make your SO the center of your speech – but don’t forget to thank all of the other amazing people too (your parents, your Maid of Honor, your bridesmaids, and so on). Choose the right jokes. Everyone loves a good joke, especially in this kind of contexts. However, it is crucial to keep in mind that not all jokes are wedding toast-appropriate. Of course, there are the ones you wouldn’t even consider including in such a special moment. But there are also jokes you may not instantly realize they are offensive. And there are also jokes not a lot of people will understand because they refer to events only a few of the guests are familiar with. Keep these ones out of your speech if you want to make everyone feel great about it! You can definitely include a poem – or a few lines of a poem. It’s a romantic touch that will add depth and sweetness to your wedding speech, creating the perfect balance between emotion and humor. 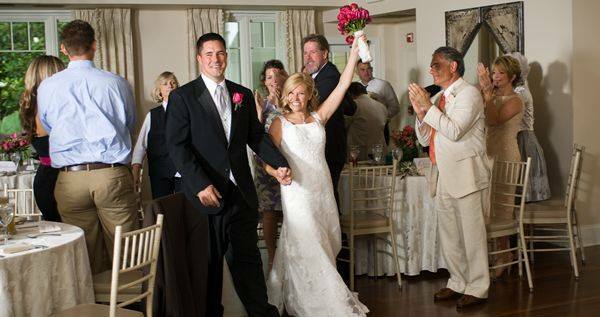 Looking for the perfect wedding venue on the Eastern Shore? Contact The Oaks and schedule your tour of our personal grounds – we guarantee you will LOVE it here!